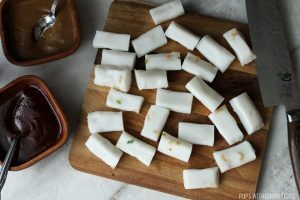 When it comes to Chinese rice rolls (cheung fun), I usually only associate it with breakfasts and it’s almost always steamed – not to say you can’t have these crispy rice rolls (cheung fun) for breakfast because I do all the time, so I won’t judge 😉 but if you follow along with with me lately you’ll notice that I have a thing for crispy foods, so I’m sure you know where I am going with this. 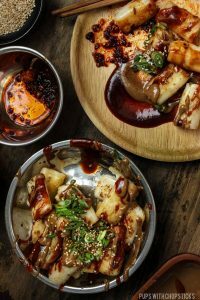 This recipe is meant to be super easy and hassle free, something to hit that snacky craving quickly, so it wouldn’t make sense for us to steam our own rice rolls to make this dish so for this recipe, use pre-made rice rolls from the Asian grocery stores. They are usually found in the refrigerator section by the tofu and fresh noodles. For this recipe, you can substitute maple syrup with honey if it is easier to find. Nuke it for 20 seconds, seriously – that’s all it takes. I find it easier to cut the cheung fun into smaller pieces when they are straight from the fridge and still cold. Once it’s cut up, stick it in the microwave and nuke it for about 15-20 seconds to slightly soften it before toasting it in the frying pan. This is a completely optional step, and the results are pretty much the same if you choose to just crisp it up in the skillet directly from the fridge, this step just shaves off about 1-2 minutes off the crisping time – when you’re as impatient as me, that’s a lot of time. 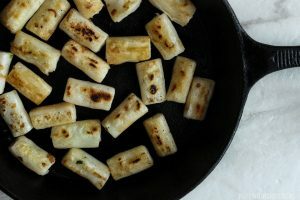 The less you touch the rolls while it’s toasting in the skillet, the better chance you will get it charred and crispy. You’ll know it’s done when the rolls are soft when you press down on them and they have a charred crispy exterior. Lao Gan Ma chili crisp oil – This stuff is seriously AMAZING with this recipe. 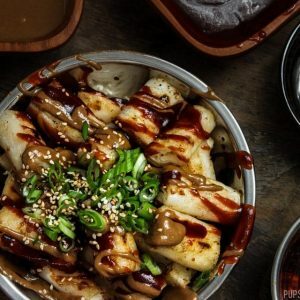 Make the maple sesame sauce by combining the ingredients in the list. If the sauce is too thick, add a flavourless oil (canola, vegetable, corn oil) 1/2 tablespoon at a time and mix until it is the right smooth and thin consistency you like. Remove the rolls from the packaging and separate them into individual sticks. Cut them into small 1 inch pieces. (Optional Step) Microwave them for 15-20 seconds to soften them up. This will shave off 1-2 minutes off the crisping time in the frying pan. 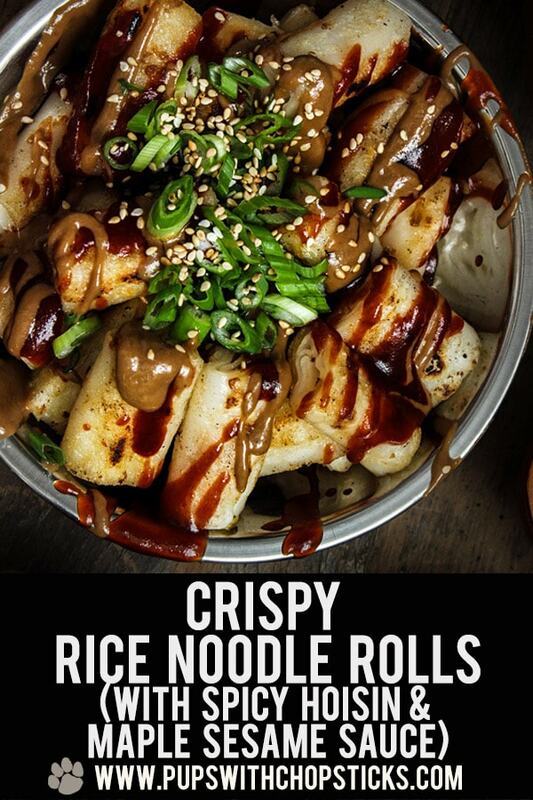 Drizzle (or drown) the rolls with sauce and enjoy! Save some sauce on the side for dipping! 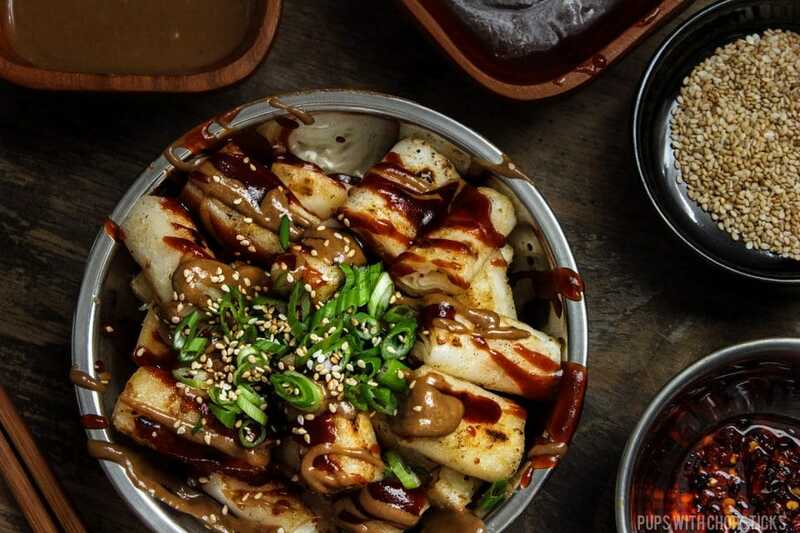 Do not substitute Chinese toasted sesame paste with tahini – it does not taste the same. You can substitute sesame paste with natural unsweetened peanut butter. 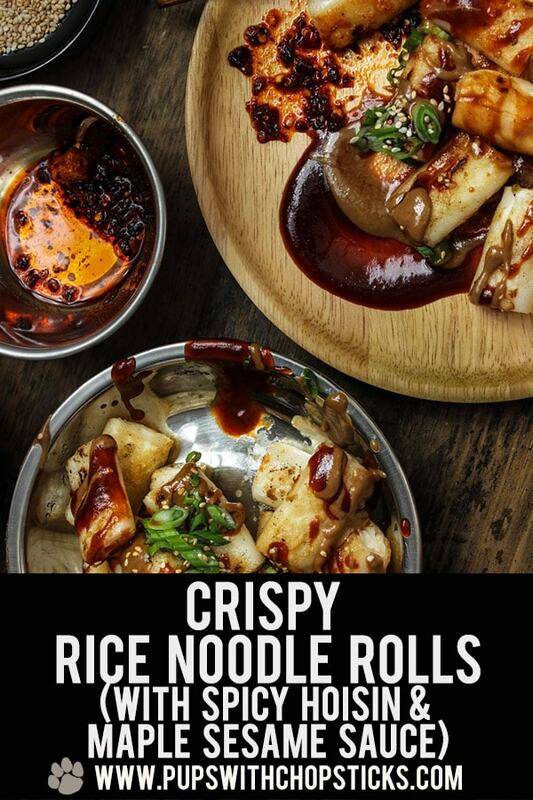 Awesome but where do i get rice rolls? Any recommendations? AHHHH I LOVE THIS STUFF. i used to beg my parents to buy it from the market, and then they’d pan-fry some up for lunch and serve it with chili garlic sauce and hoisin sauce. agh i need to buy some asap! Interesting…! yummm this looks so delicious and its sauce is too delicious, am so glad reads your recipe, Thanks for sharing…! Oh, now you reminded me this Chinese Cheung Fan. Thanks for your recommendations and tips for different kind of sauces. Yes, I agree this is a super fast cooking, doesn’t take you minutes that can ready serve to eat. Yeah !!! THANK YOU. 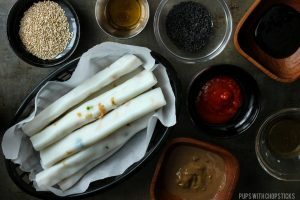 Interesting, I have never heard of these chinese rice rolls. That is very cool:) They look yummy too! Oh my goodness, my mouth is watering for this. I love that you outlined all of the steps. Yum! These look so delicious! I’m with you, I’m all about crunchy! Perfect! Thanks for the tips on how to char the rolls. 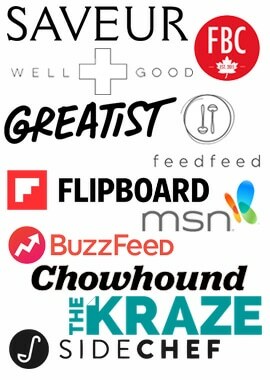 Your photos look awesome, I can seriously hear my stomach growling.